When I use the term “solid surface” most people have no idea what I’m talking about. 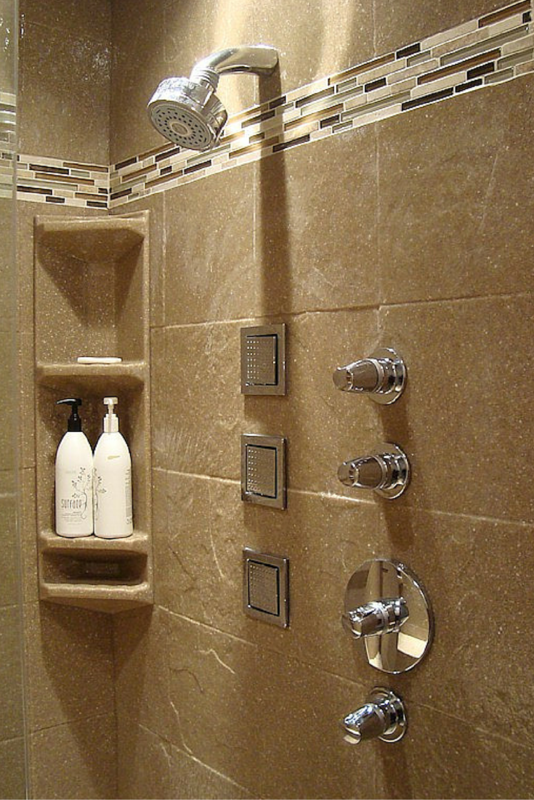 So the question you might have is, “why are you writing about stone solid surface shower kits when most people don’t even know what they are?” The answer is simple. These kits are durable, flexible and growing rapidly despite being relatively unknown. My goal with this article will be to grow your knowledge of this shower product. What is stone solid surface exactly? Most people have heard of the countertop brand Corian made by Dupont. What they don’t realize is Corian is actually a man-made stone and epoxy aggregate (also known as stone solid surface). Basically “Corian” is to solid surface what “Kleenex” is to facial tissue…. it is a brand name which is synonomous with an entire product category. With that being said this article is not about Corian or about countertops – it is about stone solid surface and its’ use as a contemporary low maintenance shower kit. 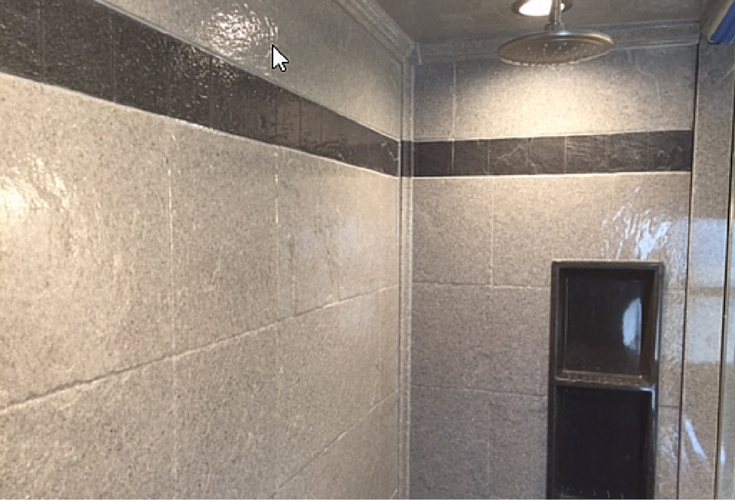 Read further to learn 3 steps to take to evaluate selecting this material for your next shower remodeling project. Stone bases are available in 37 standard sizes and common shapes (including squares, rectangles, NEO angles and even a curved front option). While selecting a standard size/shape is most cost effective any custom configuration (with your choice of drain location) is possible. 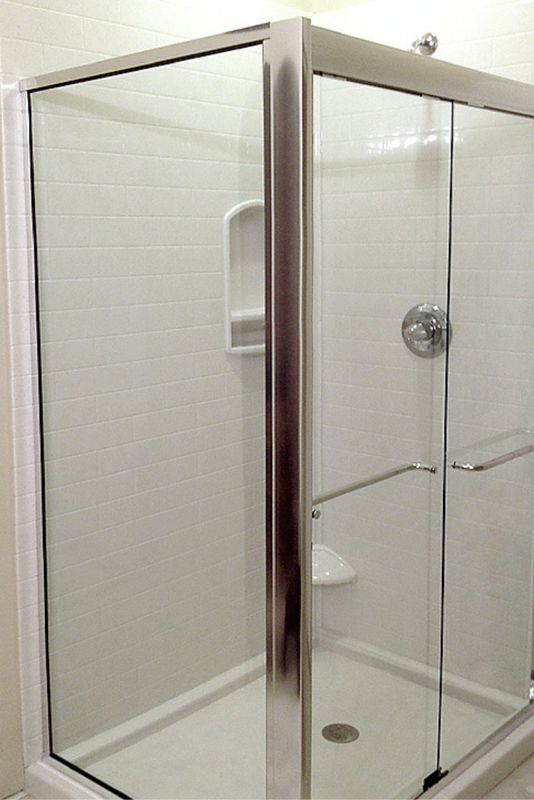 4” standard curb –This traditional curb height works well for a small corner or stand up shower where no family members have mobility issues. Low profile 1 ½” curb – A low profile curb creates a sleek, contemporary look and is easier to step over. In addition you can add a ramp extension to this base for wheelchair access down the road if you end up needing this functionality. 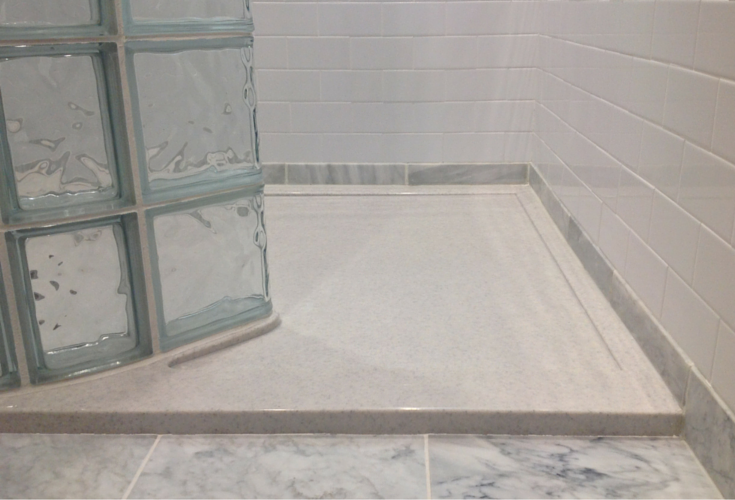 Wheelchair ramped entry – A cultured marble roll in shower can be made with a ramp built into the shower pan. These bases can be used in any sized space with the proper planning. With over 35 colors you’ll be able to match, or contrast, your other bathroom decor. The top of this base is prefinished so there is no additional finishing work required. Design Choice #1 – Smooth and glossy – If smooth, clean-looking and low maintenance are the ticket for you, high gloss solid surface is the answer. 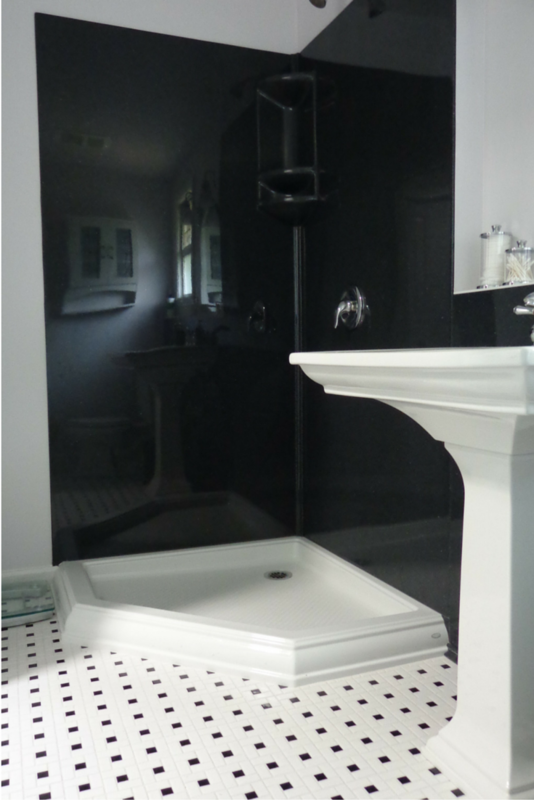 I just love the shiny appearance of the black and white bathroom below. The black high gloss wall panels really make this space pop. Design Choice #2 – 12” x 12” stone tiles – Imagine the elegance of 12” x 12” stone tile while eliminating the challenge of cleaning grout. This solid surface wall panel pattern can be made as large as 106” x 96” and it’s even possible to include a decorative trim border. Design Choice #3 – Subway tile – The classic simplicity of the early 20th century subway tiles are exploding in popularity in today’s modern bathrooms. Whether you select a classic white or 35 other colors, you’ll love the classic look and low maintenance of this wall panel solution. Idea 1 – Add niches and shelves – You’ll need places to house your stuff (shampoo, soap, sponges, razors etc.) and keep yourself safe by not placing slippery bathroom products on the floor. The way to accomplish this is with recessed niches, corner shelves or corner caddies. Idea 2 – Take a seat – A luxury spa shower is not complete without a place to relax and unwind after a long day of work. 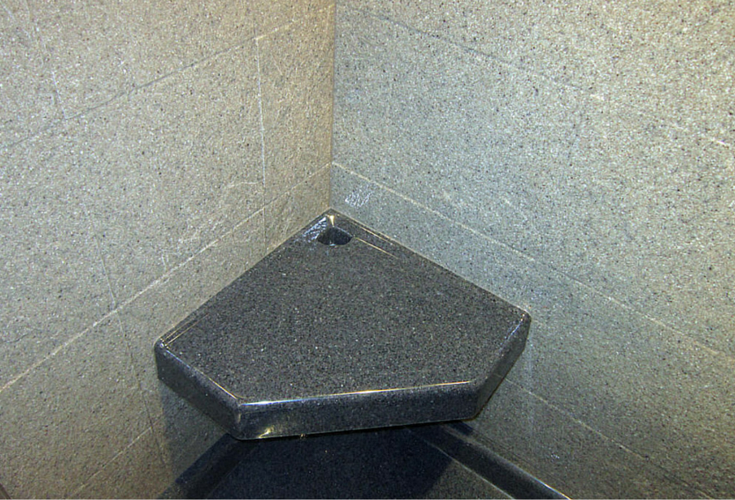 Solid surface shower seats and benches come in a variety of standard and custom sizes which work well in moderate to larger showers. 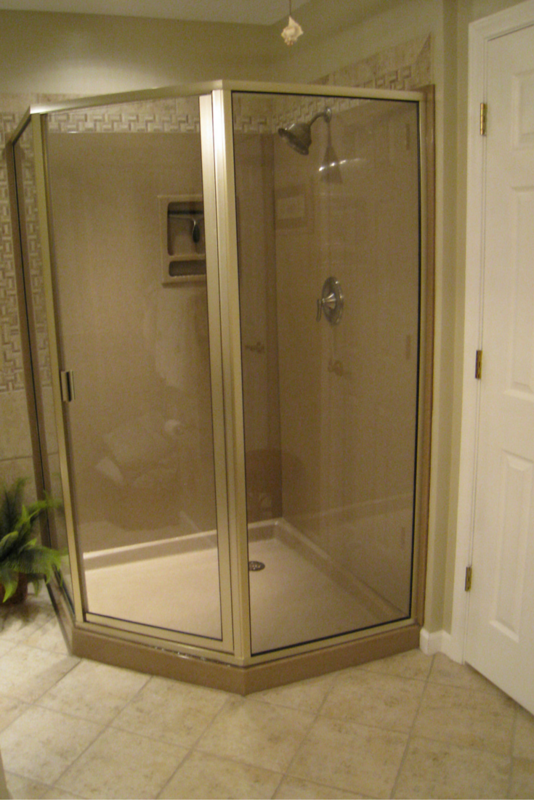 Idea 3 – Personalize with shower trim – Elegance and details are permanently joined at the hip. For a finishing touch you can create a custom “woodwork” appearance by adding solid surface crown moldings, rope trim or decorative inside or outside trim pieces. 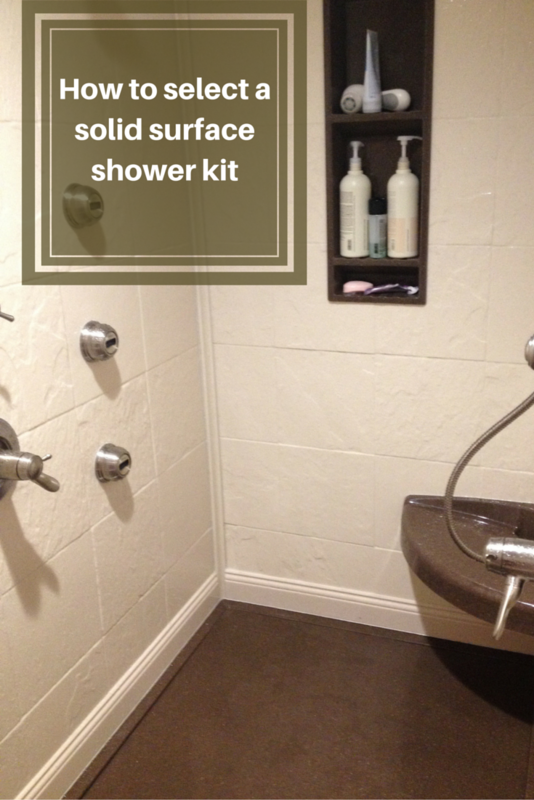 Do you now have a better understanding of how to select a solid surface shower kit? Please call or comment below for additional design input or a free estimate. For a local installation project call The Bath Doctor in Cleveland (216-531-6085), Columbus (614-252-7294) or for nationwide supply Innovate Building Solutions (877-668-5888). Connect with the Author on Twitter @Mike_Foti or his company @InnovateBuild. Do you have installers in AZ? We are interested in installing this in our home, do you install in Ga orbcan tou recommend who’ is in Georgia. Kevin – thanks for your question. 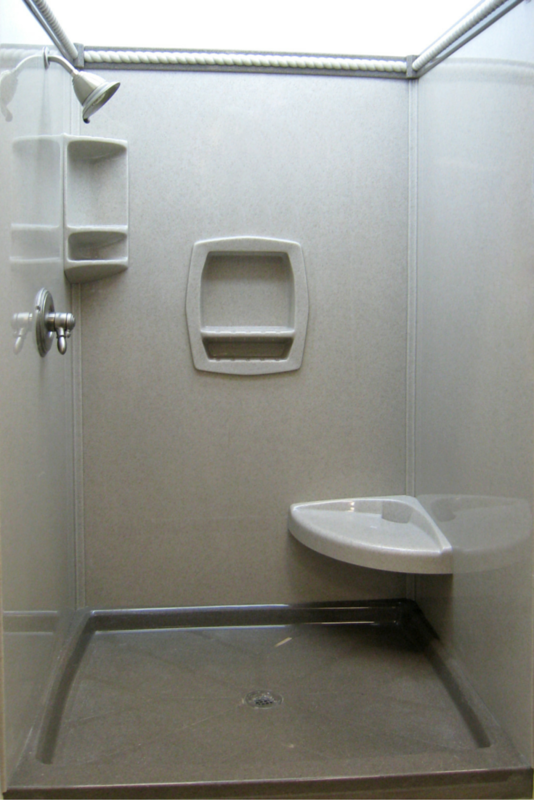 The cost for a 60 x 36 solid surface standard shower pan, wall panels and the installation adhesives would be about $2,000. You can choose any of the 51 standard gloss patterns. Can we help you any further? Mike, what kind of cost would there be for subway tile panels for a 3 x 5 shower, with a pan. Roger – we carry the Onyx brand of solid surface which we wholesale across the United States and install through our remodeling divisions in Cleveland and Columbus. How did you get into the solid surface fabrication business? How’s business for you right now?